Roasting the tomatoes brings out the sweetness. It takes about 3 hours - a good weekend morning project if you don't want your oven on during the heat of the day. Meanwhile, shuck the corn (I tried this microwave method and it worked great), and cut off the kernels into a large bowl. Heat about a tablespoon of olive oil in a large skillet over medium high heat. Add corn and saute until lightly golden. In a small bowl, whisk the lemon juice, mustard, 1/4 cup of olive oil, and salt and pepper to taste. 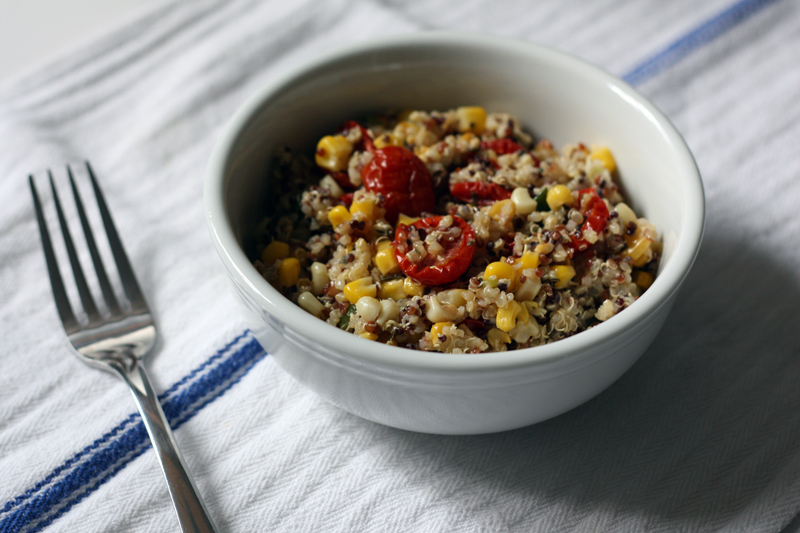 When the quinoa is done, transfer to a large bowl and toss with the dressing. Add the corn, tomatoes, basil, thyme, and green onions. Stir well to combine and refrigerate at least an hour before serving. For our Father’s Day celebration I offered to bring this salad because it’s simple to make and a crowd pleaser, but when the store only had unshelled edamame, the simple factor went out the window. Instead of going to another store, I stood over the sink and shelled 3 bags of edamame. The payoff was that the beans tasted fresher after being frozen in their shells. At least, that’s what I’m telling myself. This salad is best after a couple hours in the fridge. At first, the onions and mustard may seem a bit pungent, but they mellow nicely. 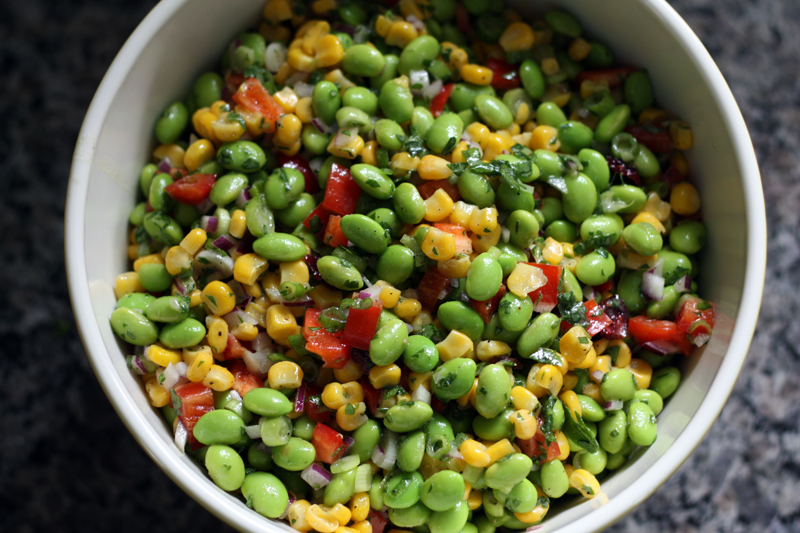 In a large bowl, combine edamame, corn, red bell pepper, green onion, red onion, dried cranberries, parsley, and basil. In a small bowl, whisk together dressing ingredients. Pour over vegetables and stir well. Refrigerate until ready to serve. 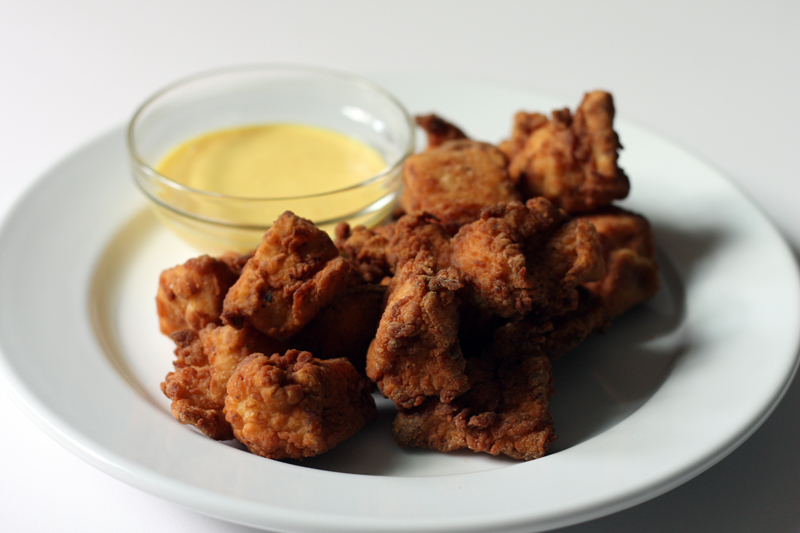 This recipe caught my eye because it promised to taste just like Chick-fil-a nuggets. I made them for a family party and they were such a hit that my brother asked me to make them for my niece’s birthday party. The nuggets are great, especially with the honey mustard dressing. This recipe makes enough for a small crowd, but if you don’t have a small crowd leftovers can be frozen for up to a month. About the frying - I've found that the first batch gets very brown very quickly, so I fry one or two nuggets to start off with. The oil will "cool" a little after you start frying. As long as it stays around 330° to 340° it should be fine. The first time I made the dressing I didn't think there would be enough for all the nuggets, so I made a double batch. Then I ended up having half of it left over. This amount should work fine, but by all means, make a little extra, just in case. Leftover dressing will keep for a few weeks (or even longer?) in the fridge. In a large bowl, whisk together milk, eggs, and 1 tablespoon salt. Add chicken pieces and stir to coat. Cover and refrigerate for 2 to 4 hours, or overnight. Combine dressing ingredients in a small bowl and refrigerate until needed. In a large zip top bag, combine flour, powdered sugar, salt, and pepper. Seal bag and shake to combine. Heat oil in a dutch oven or deep pot over medium high heat until the temperature reaches 375°F. With a slotted spoon, transfer half of the chicken from the marinade to the flour mixture. Seal bag and shake to coat all the pieces. Fry nuggets a few at a time, shaking the excess flour off before carefully placing in the oil (hot oil splashing onto your skin is not pleasant). It should take 3-4 minutes per batch, depending on the size of your chicken pieces. Remove with a slotted spoon (I use one of these spider strainers, which works great) to a baking sheet lined with paper towels. These are best served immediately, but can also be frozen or refrigerated then reheated in the oven at 400°F for about 15 minutes. This is an old family favorite. 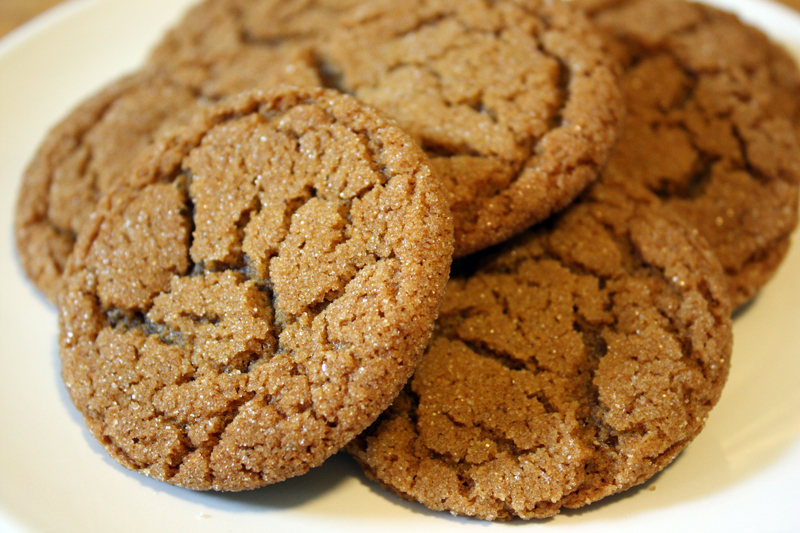 The recipe came from my grandmother and she used to make these cookies all the time. Whenever we went to visit she would have a tin of them waiting for us. 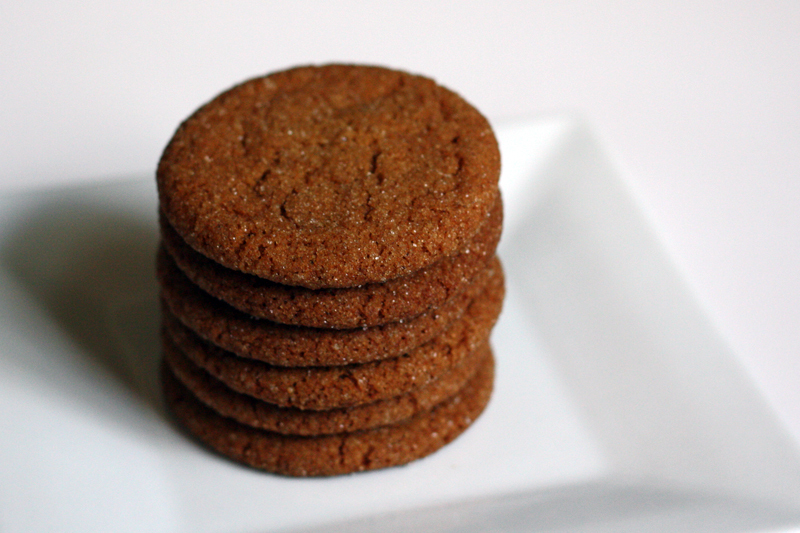 They’re similar to gingersnaps, but they’re soft and chewy. Perfect for the holidays. Or any time of year, really! For a long time we thought that using shortening was essential to get the right spread and chewiness. Once, my mother accidentally used butter and they just weren’t the same. I don’t like to buy hydrogenated vegetable oil so I’ve been trying to come up with an alternative. It finally dawned on me to try coconut oil, so I did and it worked beautifully! 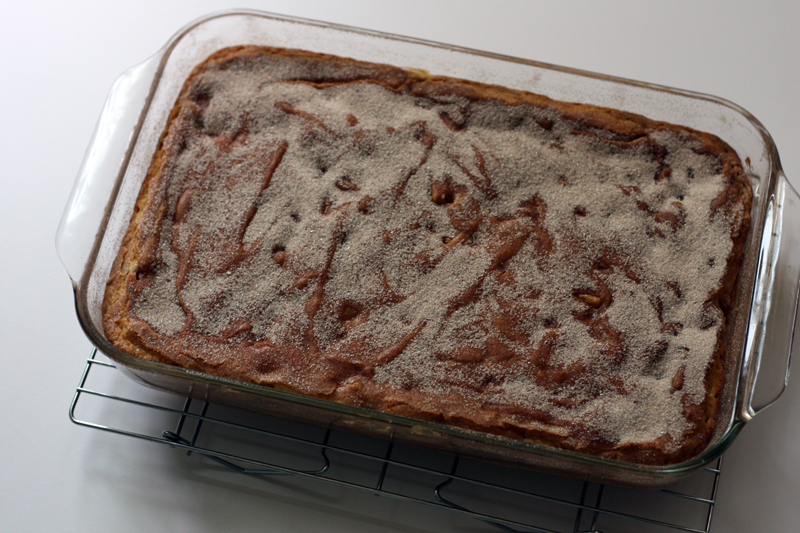 Combine coconut oil, sugar, molasses and egg and beat with mixer. Sift together flour, salt, baking soda and spices; add to first mixture and mix well. Refrigerate dough for about an hour, or until chilled. Form into 1" balls, roll in granulated sugar and place on greased cookie sheet 2" apart. (note: I use a parchment lined cookie sheet and it works fine). Do not press down. Bake for 10 minutes, rotating pan after about 8 minutes to bake evenly. Cool on wire rack. Matt has decided that he wants to hone his grilling skills this summer, which couldn’t make me happier! He’s been out of practice ever since I kind of took over the meal preparation when I moved in, 4 years ago. Not that I ever discouraged him from manning the grill. In fact, standing over a fire is the last thing I want to do on a hot summer day. He picked out this recipe over the weekend and I helped him adapt it according to the ingredients we had available. It’s nice to have a cooking partner! Whisk together marinade ingredients. Place chicken in a large zip-top plastic bag. Add marinade; seal. Marinate in refrigerator 2 hours, turning bag occasionally. Remove chicken from bag, reserving marinade. Place reserved marinade in a small saucepan; cook over medium heat 3 minutes. 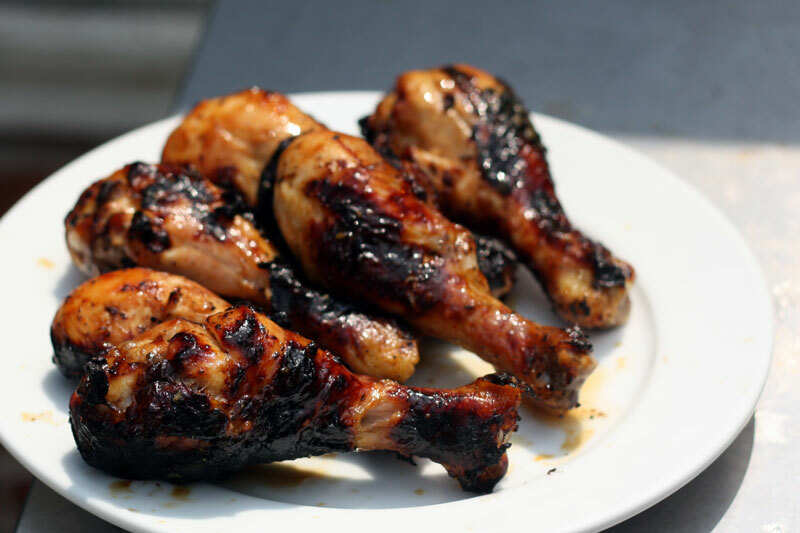 Place chicken on grill coated with cooking spray; grill 30 minutes or until chicken is done, turning and basting occasionally with reserved marinade. 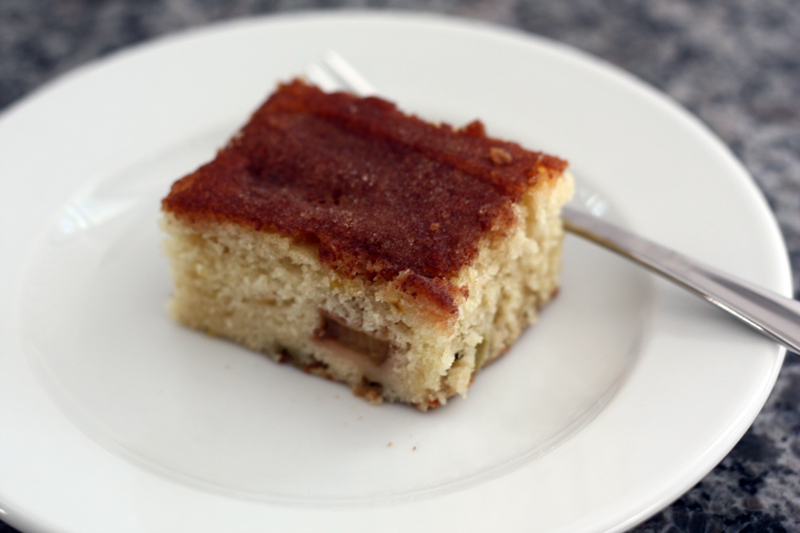 There are so many reasons to love spring and right up there with short-sleeves, sandals, sprouting seeds, and tulips, there’s rhubarb cake. Light, fluffy, studded with tart pockets of softened rhubarb, and dusted with cinnamon sugar, it’s one of my family’s favorites. This year I was able to make it with rhubarb from my own garden. Preheat oven to 350°F and grease a 9x13 pan. Cream butter and sugar with eggs, vanilla, and lemon zest (if using) until light and fluffy. Sift flour, baking soda, and salt together. Add flour mixture alternately with buttermilk; fold in rhubarb. Pour into prepared pan. Mix together topping ingredients and sprinkle evenly over batter. Bake for 35 minutes or until toothpick inserted in center comes out clean. Some of my favorite recipes are the ones I grew up with. 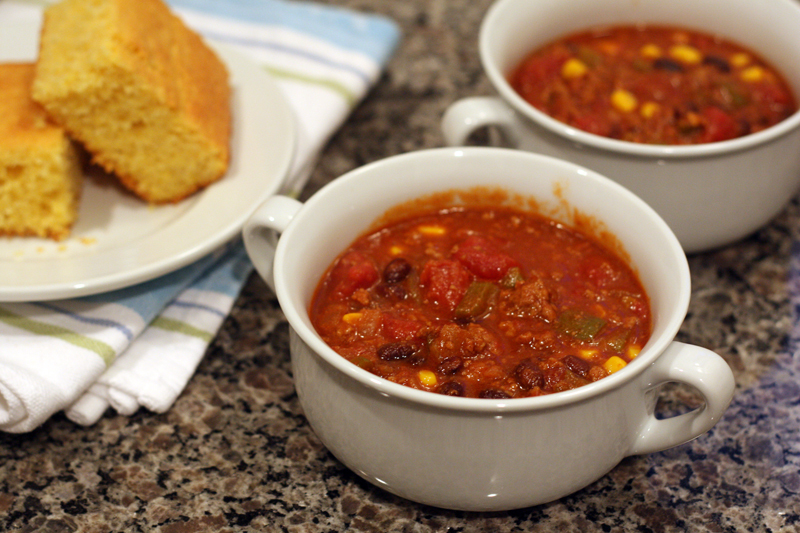 This is based on my mom’s recipe for chili, which she always served with corn bread. It makes a regular occurrence at our dinner table and it hits the spot every time. UPDATE 10.07.16 – This chili won a chili cook-off! Admittedly, it was a small contest, a fundraiser for my son’s preschool, and most of the other 6 entries were not traditional. But still a proud moment! The only thing a did differently this time was cook it low and slow for about 5 hours. UPDATE 02.21.17 – Tested this in the pressure cooker – 20 minutes at high pressure, NPR 10 minutes, then added the beans and corn. I ended up leaving it on slow cook for a couple more hours, not because it needed it, but because we weren’t going to eat for a while. Turned out great! 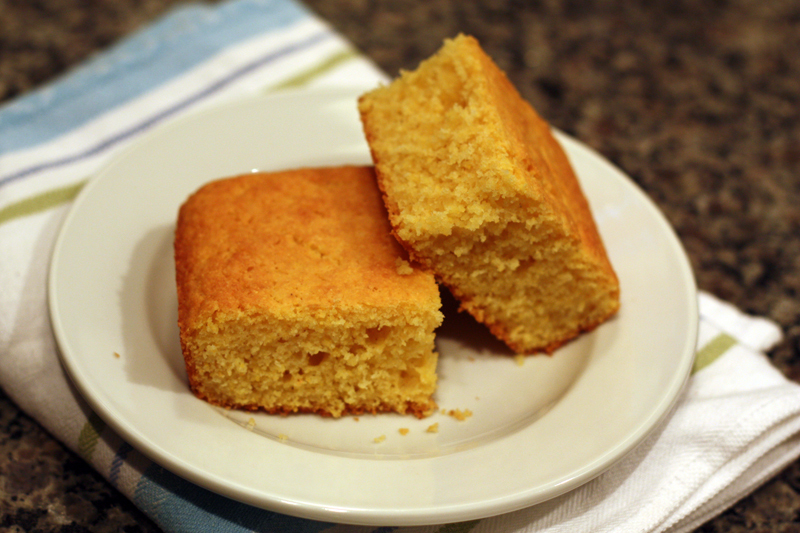 For as long as I can remember, when my mom made chili, this corn bread never failed to be right alongside. My mom would cut the pan into 9 pieces, and the lone piece that was not a corner or a side was the most coveted. We would eat it drizzled with warmed honey, but these days Matt and I have taken to crumbling it right into the chili. I have a tendency to buy vegetables then let them sit in the fridge until they go limp and start growing fuzz. It’s wasteful and it makes me sad so I’ve decided to quit. Cold turkey. No more rotting vegetables! This is a good weekend breakfast or brunch dish to make use of the extra vegetables you may have laying around. I had broccoli, a small zucchini, and part of a red pepper. Whatever you have, just shred it or chop it up pretty small and saute with some onion and garlic. Toss it with some cubed bread, your choice of herbs and cheese and top it off with beaten eggs and milk. Heat olive oil in a large pan. Saute onion, garlic, and vegetables until soft. Remove from heat and let cool slightly. 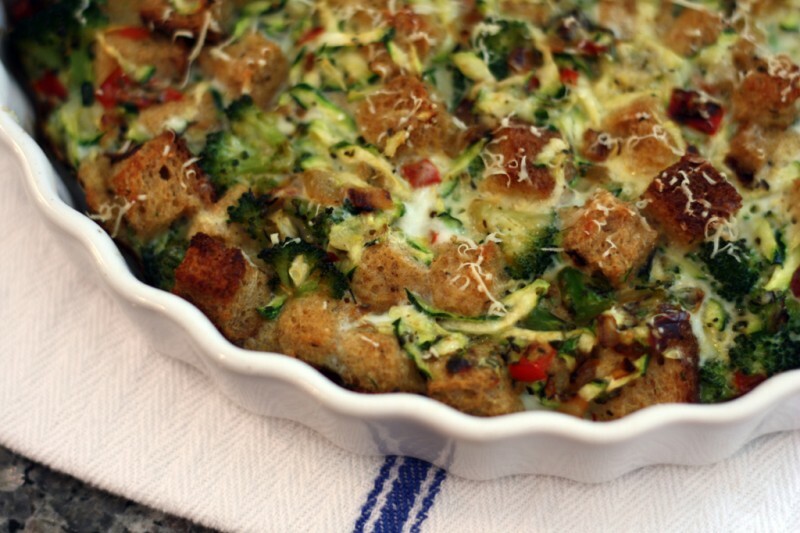 In a large bowl, combine bread cubes, cheese, herbs, and cooked vegetables. Arrange in a baking dish (about 9-inch round or 8-inch square). In a medium bowl whisk together eggs, milk, salt and pepper. Pour slowly and evenly over the bread/vegetable mixture. Bake for about 25 minutes, or until set. Remove from oven and let cool 5 minutes before serving. One of the perks of having an awesome client like Marina of My Better Butter is that every time I see her she sends me home with a jar (or two) of her delicious peanut butter spread. I have to restrain myself so that I don’t eat the entire thing in one sitting. As I was working on the website I couldn’t help but to start brainstorming recipe ideas. That’s just what I do. And, since half of my freezer is being taken up with super-ripe bananas (I really should stop buying bananas), I thought a banana bread would be the perfect starting point. And then I went and cut my hand on a broken plate, rendering my right hand 95% useless. Fun. I haven’t cooked anything for nearly a week. Last night I decided I could probably make banana bread one-handed, and fortunately it turned out pretty well. 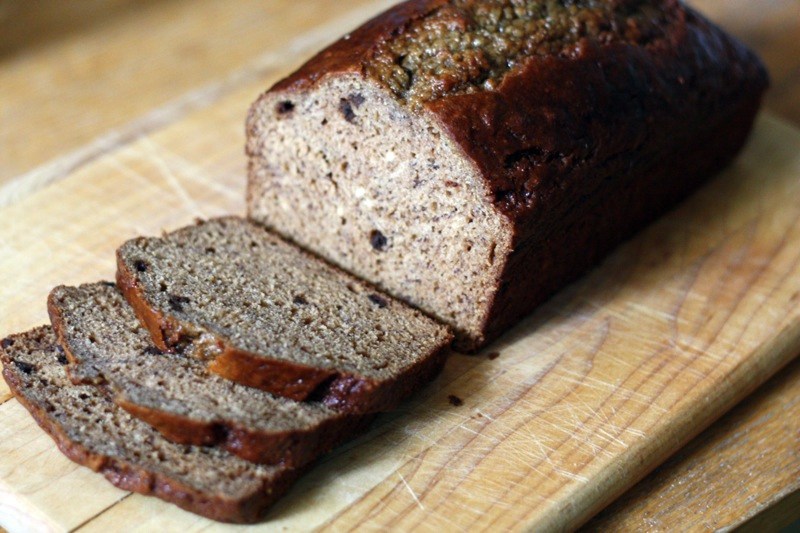 I basically replaced the butter in my favorite banana bread recipe with Nutty Chocolate Chip Better Butter. It gives the bread just a hint of chocolate flavor with tiny chocolate chips strewn throughout.